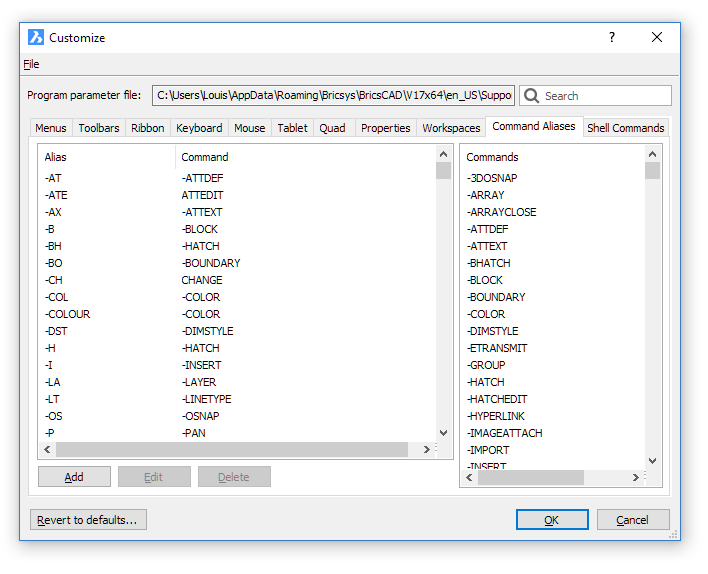 Command aliases are alternative names for BricsCAD commands. You can launch the LINE command by entering L at the command prompt. There is no need to type the complete name. After typing the command alias at the command prompt the command is executed. Some commands have more than one alias: e.g. REC, RECT and RECTANGLE are all aliases for RECTANG, whereas the last alias is even longer than the command name. In general, command aliases can increase your speed in entering the commands at keyboard. Command aliases are saved in a *.pgp file (P roG ram P arameters file). By default the default.pgp file in the Support folder of the Roamable Root folder is used. If a command can be executed transparently (= while another command is being executed), the alias can also be used transparently. To execute a command or an alias transparently, precede the command name or alias with an apostrophe ('). Unlike commands, aliases are only local and cannot be used as global (preceded by a underscore (_). Command aliases cannot be used in scripts (*.scr). In order to modify existing aliases or to create new ones, the default.pgp file can be edited using an ASCII text editor (e.g. Notepad). The first section of the default.pgp file defines the Shell commands. The second section of the default.pgp file defines command aliases. alias = the character string to be entered at the command prompt. The command alias must be followed by a comma (,). command = the BricsCAD command. The command name must be preceded by an asterisk (*). Comment lines must be preceded by a semicolon (;). Comment lines can be used to add additional information, e.g. when the file was last edited and by whom. Execute the REINIT command to reload the alias file when it was externally edited. 1. Open the Customize dialog. 2. Click the Aliases tab on the Customize dialog. Click the down arrow at the right hand side of the Command field, then select a command. You can start typing the command name in the Command field to easily find the command in the list. Type the command alias for the command in the Alias field. Select the alias in the list. Type a new alias in the Alias field. If the alias already exists you are prompted to overwrite the existing alias. Click the OK button on the Confirm box to delete the alias. 6. Click the OK button on the Customize dialog to stop. If you use the Customize dialog to edit the alias file, it is not necessary to execute the REINIT command.